This Kingsport SE travel trailer will have you planning camping trips each chance you get away from work. You and seven others will find sleeping space on a queen bed and double size bunks, as well as on the furniture once folded down for the night. The private toilet and tub/shower allow someone to be getting cleaned up while another person is just outside the door washing their hands or brushing their teeth. Everyone can visit while relaxing on the sofa or sitting at the booth dinette. I'm sure the kids will be hanging out on the bunks if they aren't playing outside. 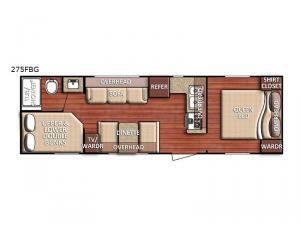 Come see what else will make this the perfect RV for you and your family! The Gulf Stream Kingsport Special Edition travel trailer includes Gulf Stream's time-honored and camper-proven Uni-Body construction, a three year structural warranty, and extensive storage space throughout. You will surely enjoy the large picture windows allowing more natural light inside, plus there are options to choose from to create the perfect setup. All you need to do is choose your favorite floorplan, and head out today!